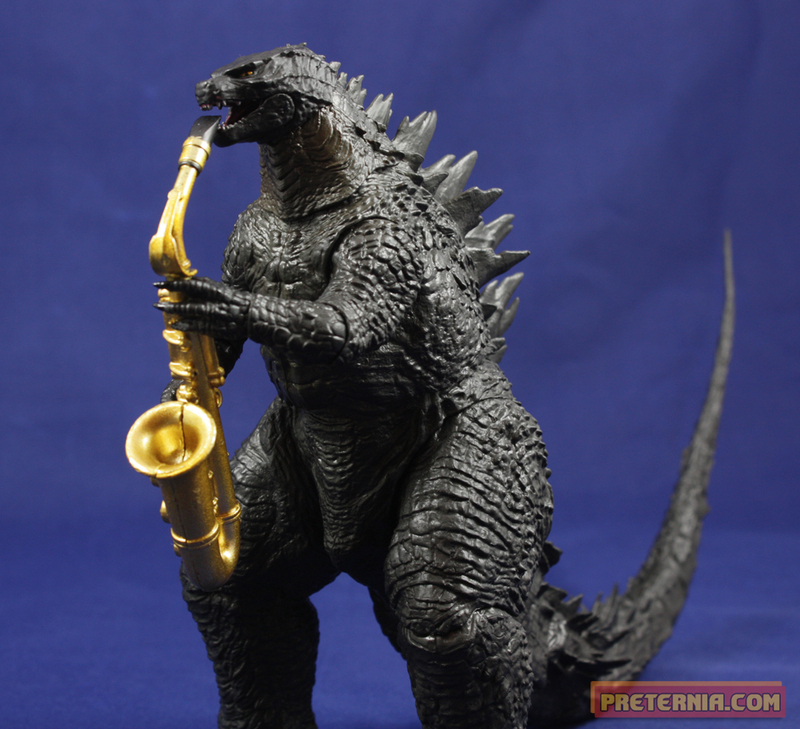 So is everyone over the new Godzilla movie yet? It seemed like people could barely keep their pants on in anticipation of this new movie. Then a week ago it came out and the reviews I’d heard were moderate at best. I’m pretty sure the movie made a ton of money, but that buzz really died down after people saw the thing. Did I see it? I downloaded a copy but it didn’t really keep my interest so I gave up shortly before the end. I think at this point I’ll just wait for it to hit DVD or cable and take a look … or at least wait out a better quality online release. I’m not a fan of Marvel movies, but I buy the toys. Even though I’m not in any rush to watch the new Godzilla in its entirety you better believe I had my finger on the trigger ready to buy this new figure from NECA! The first thing I noticed about him is that he’s a weird scale in comparison to other NECA product. Don’t expect to have him fit in with your Pacific Rim figures since at about six inches tall he is far too small. He’s basically a standalone item when it comes to mixing in with other NECA stuff. He does, however, fit into a NECA clamshell so maybe that was the consideration when size was determined. I don’t know but I don’t mind either. His size also helps him fit in pretty well with S.H. MonsterArts figures. 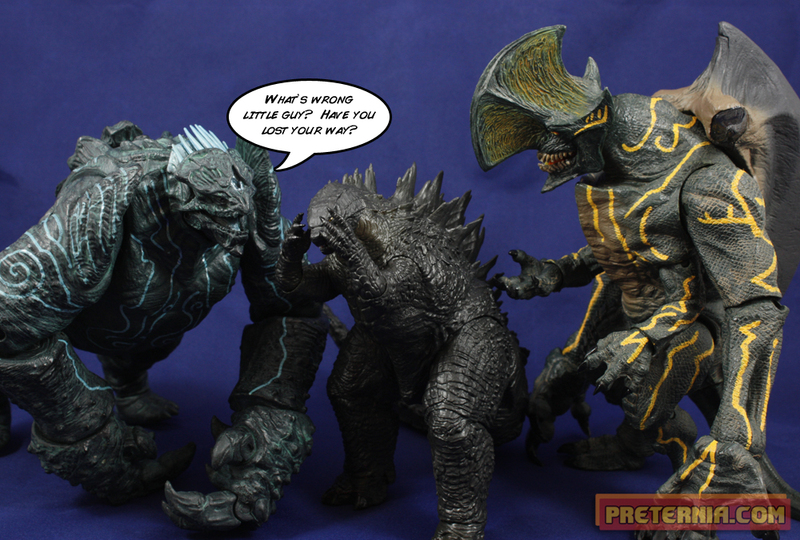 This would also make sense because it seems like NECA may have taken a few cues from MonsterArts’ engineering. He’s certainly not as articulated as an import release, but he’s also a $20 toy. The value is certainly there as far as what you get for the price. For a big (dare I say chunky?) dinosaur he still has some pretty great articulation. He’s not going to be doing splits but he is still fun to fiddle around with. At first glance it looks like Godzilla has little to no paint applications. Besides the eyes, teeth, and tongue he really is just a giant chunk of black plastic. But if you look him over closely and in the right light he appears to have some brown shading as well. It’s pretty subtle but most certainly there upon close inspection. 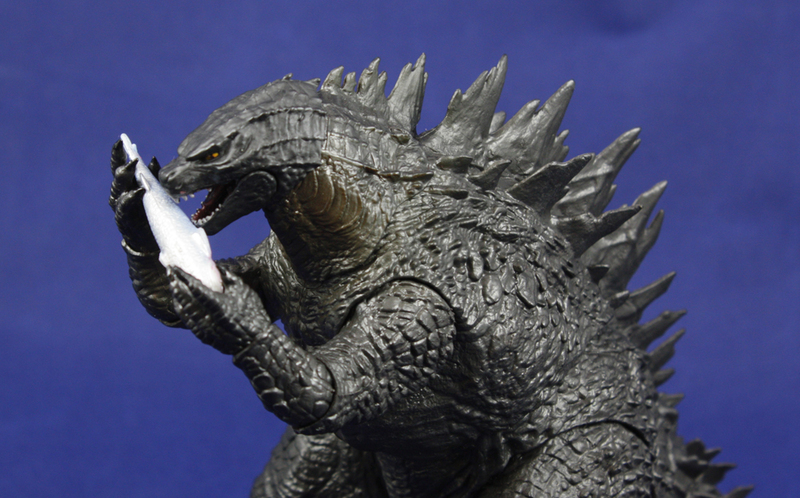 I think this is probably one of the better smaller-sized collectibles for the new Godzilla movie. Bandai made it pretty easy to pass on their stuff because you have to choose between PVC statues, tiny dollar store quality sets, or the infamous “Blue Slurpee Vomitting” Godzilla. Jakks Pacific actually made a really good version of our favorite monster, but he’s gigantic and slightly hard to find. S.H. MonsterArts also has this version of Godzilla in the works, but again, if you aren’t a huge fan it will be expensive and probably will not be out until early next year. NECA’s release hit at just the right time for casual fans of the film (or just the monster in general) to get a nice, decent sized, piece to go with their collection. He goes for about $20 and is easily available online if your local Toys “R” Us or FYE isn’t stocking him. He’s a nice figure. Nothing groundbreaking but he scratches that itch I needed for Godzilla figures in a movie year. NECA appears to be interested in doing Godzilla from other films as well, so depending on the success of this guy we may see some more releases down the road. It would be nice to get a 2014 movie version that works with their Pacific Rim stuff. Not to mention that an 18″ figure seems like a no-brainer. I think this guy is selling well, because the TRU’s near me all had several of him last week, and you can’t find him on the pegs this weekend at all. I liked the movie just fine, but it wasn’t as good as I hoped it would be. I hope the sequel will be a bit crazier, but this one was a fun first outing. Yeah he does seem to be dissapearing from the shelves as quickly as he comes. I guess I can take that as a good sign that he’s doing well. Funny thing about the movie is that no one I’ve talked to overly loved it. Said there was a fun ending but it dragged in the beginning. But apparently a lot of people saw it so it looks like we will get more, interested to see if they just have more monster fights now that they kind of did the “origin” story. Godzilla 2014 actually has the same scale with the pacific rim figure. In the pacific rim movie when trespasser go thorugh and break the golden gate, we can see that his size pretty big. 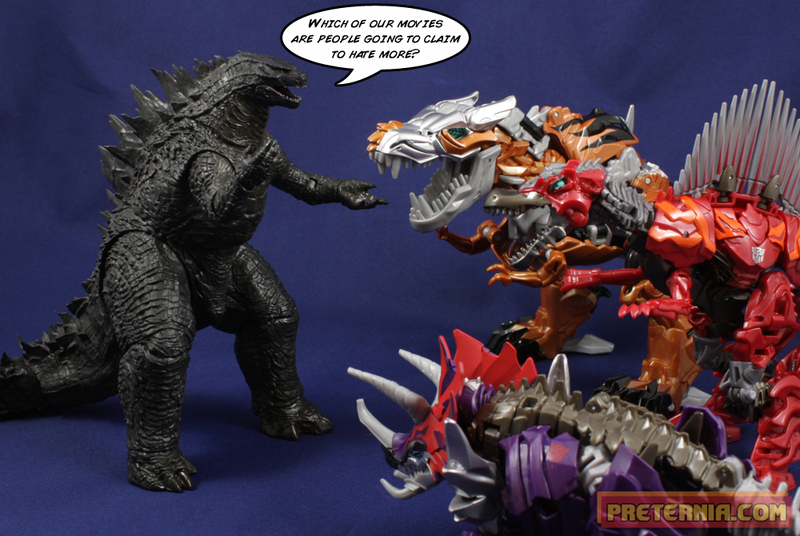 But in the godzilla movie he doesn’t seem so big compare to trespasser and knifehead in the movie. and secondly godzilla is only like 1 inch shorter than the other pacific rim figures.